What it is: A powerful daily Hair and Body Wash. Contains emollients and conditioners for healthy skin and hair. Enhanced with Scent Kapture Odor Encapsulating Technology that controls odors on contact by odor encapsulation and elimination. How it Works: Scent Kapture Hair and Body Wash formula is designed to eliminate bacteria that causes odor from the body and hair. The active ingredients in the Scent Kapture Odor Encapsulating Technology ensure that you remove any odor that wild game can detect. 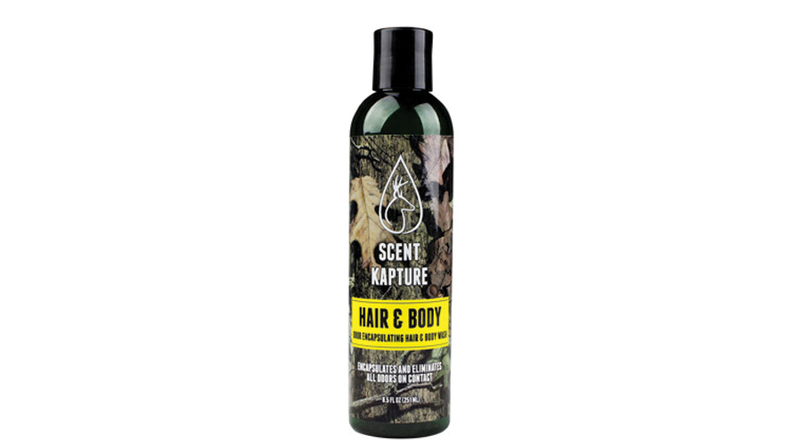 Directions: Use Scent Kapture Hair and Body Wash in the shower for body and hair to eliminate all types of odors produced by the body. Can be used daily. This is the first step in your scent free process before hunting.